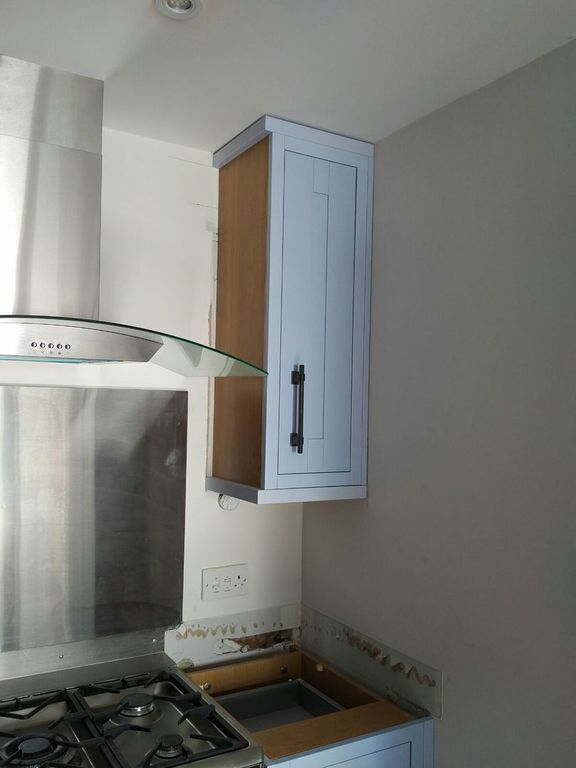 If you are having a brand new kitchen designed and fitted, do not feel that you are limited to the colours the kitchen company can supply. 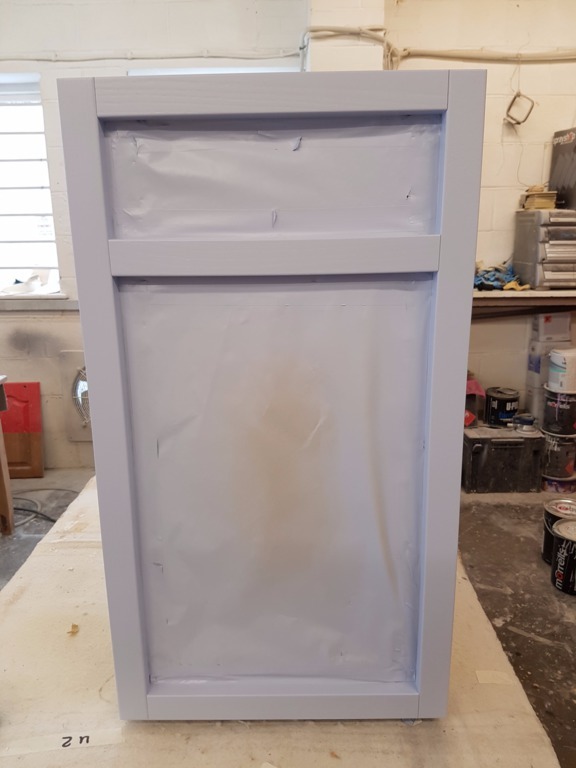 From just the centre island to the whole kitchen, we can spray paint any style of kitchen into any colour, prior to fitting. 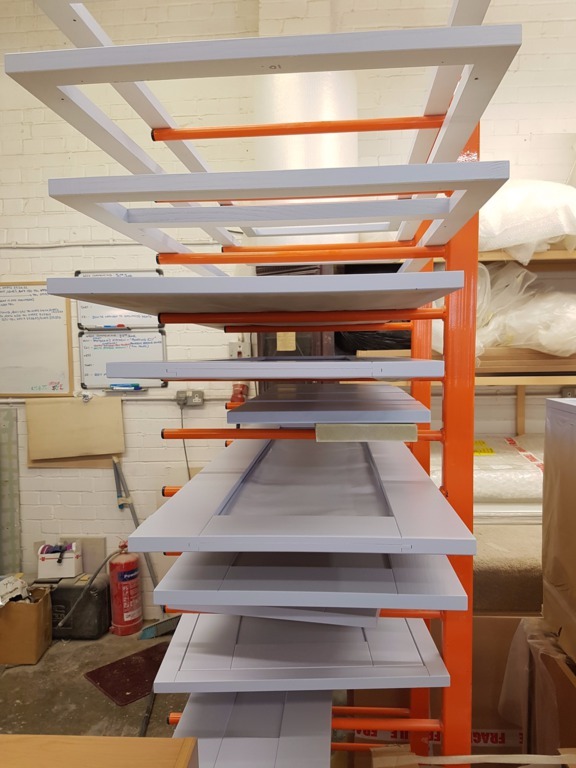 You can arrange for the kitchen to be delivered to our unit or we can collect from you the parts that require spraying. 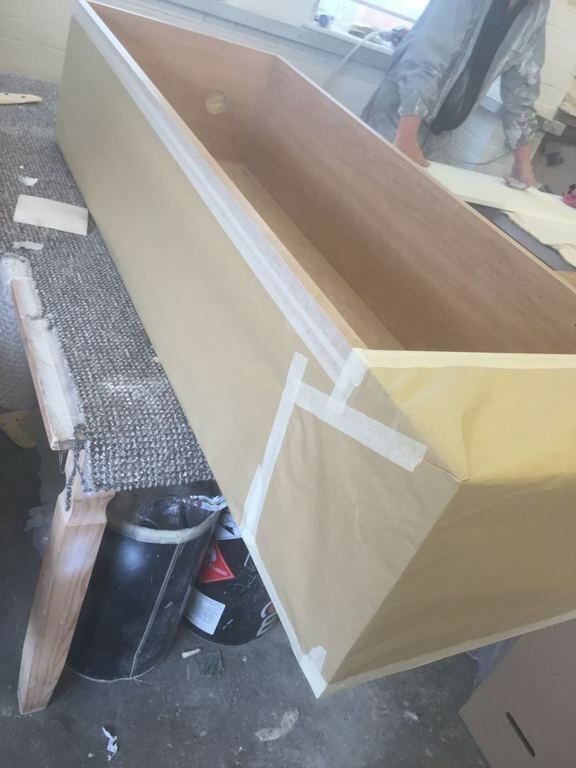 We will then prepare, prime if needed, and spray paint all the items into the colour of your choice. 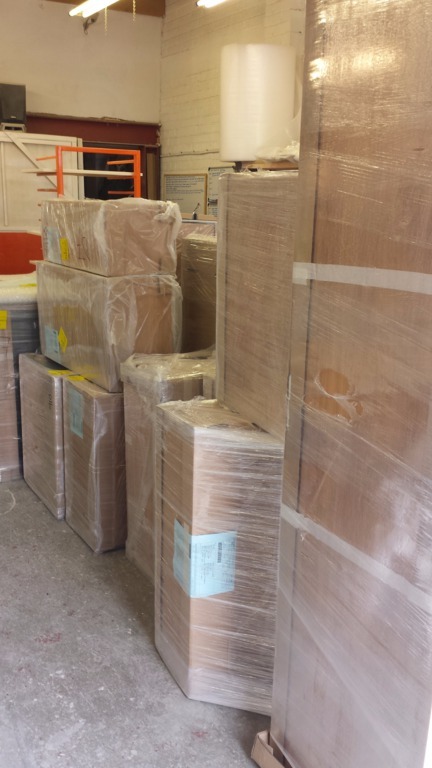 We foam wrap & pack each part in it's original packaging (so it's easier for your kitchen fitter) and then deliver them to your home. 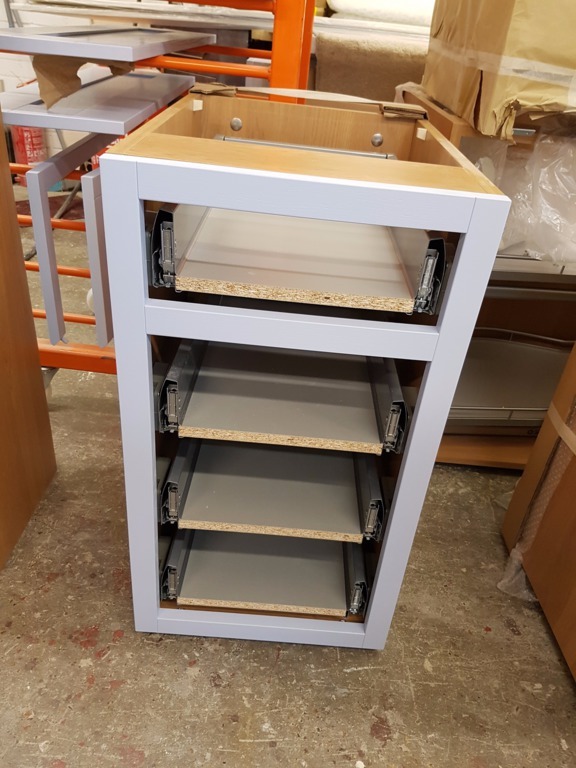 We have transformed many new kitchens by Howdens, British Standard Kitchens, Sheraton Kitchens and Ikea to name a few, plus bespoke kitchens made by carpenters or joiners from mdf. 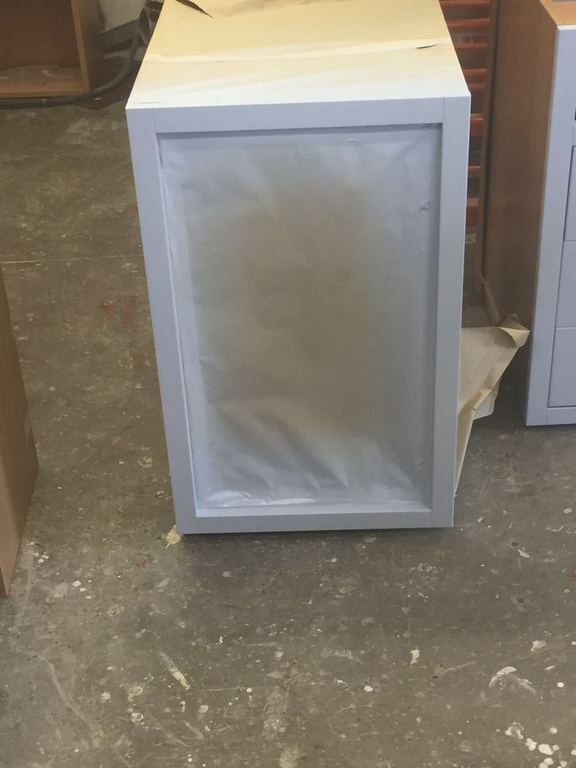 Although we can spray paint any type of door, Howdens have brought out their Burford Paintable range of doors that are already primed. 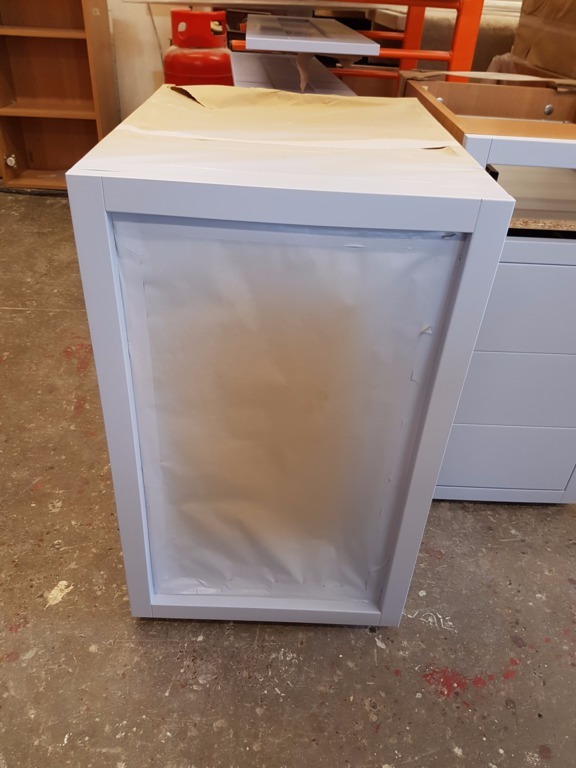 We have examples of our spray painted finish of these doors in quite a few local Howdens branches including Worthing, Shoreham, Hove & Brighton (see photos below). 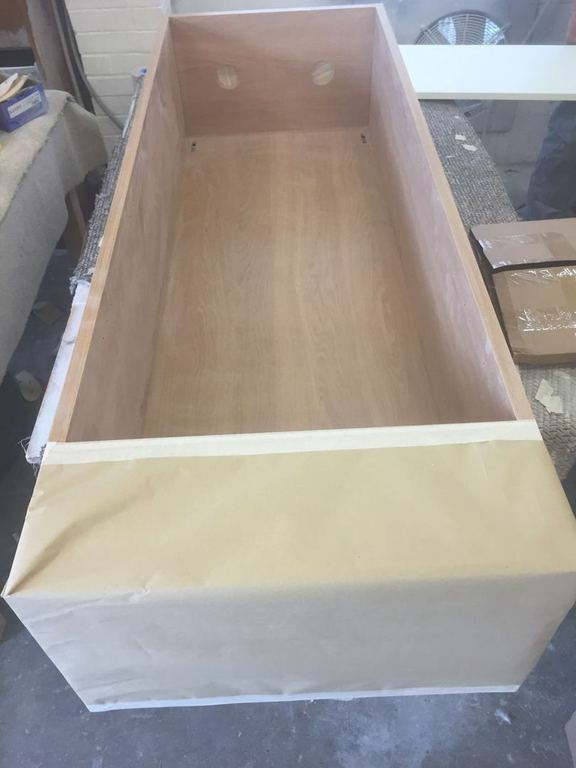 You can find more information on the paint we use on our General Info & Paint page. 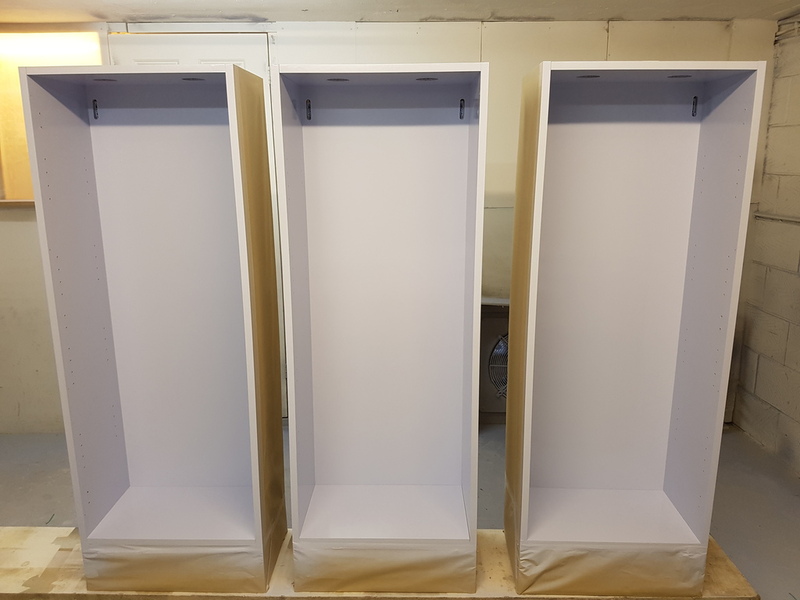 Our paint can be colour-matched to paint manufacturers such as Farrow & Ball, Dulux etc or we can send items off for analysing. In the past we have colour-matched to wall tiles, a tea cup & even a ladies cardigan! 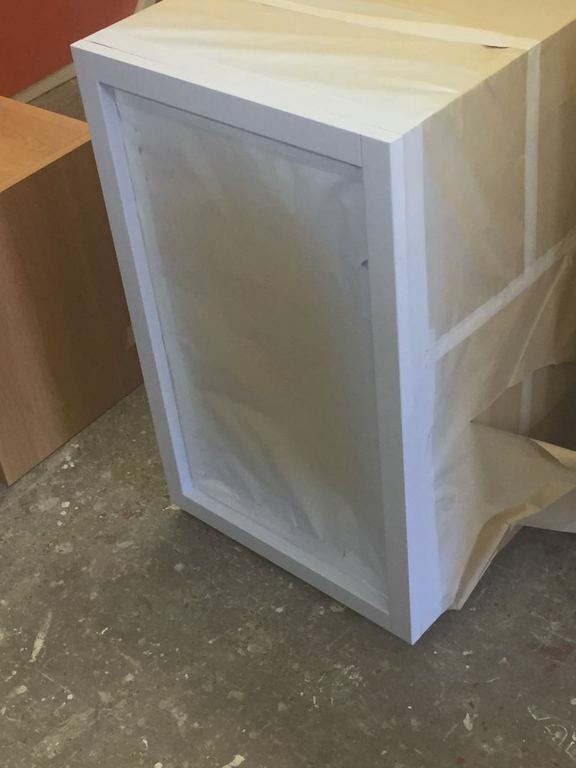 The slideshow & photos below are of some of the brand new kitchens we have spray painted. 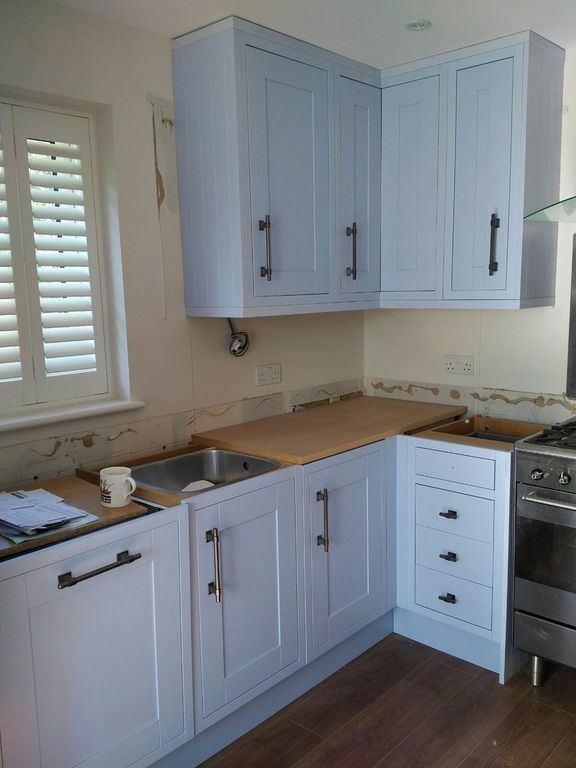 Our customers have kindly sent us these "after" photos, once their kitchen has been fitted, so we can see the kitchen finished. 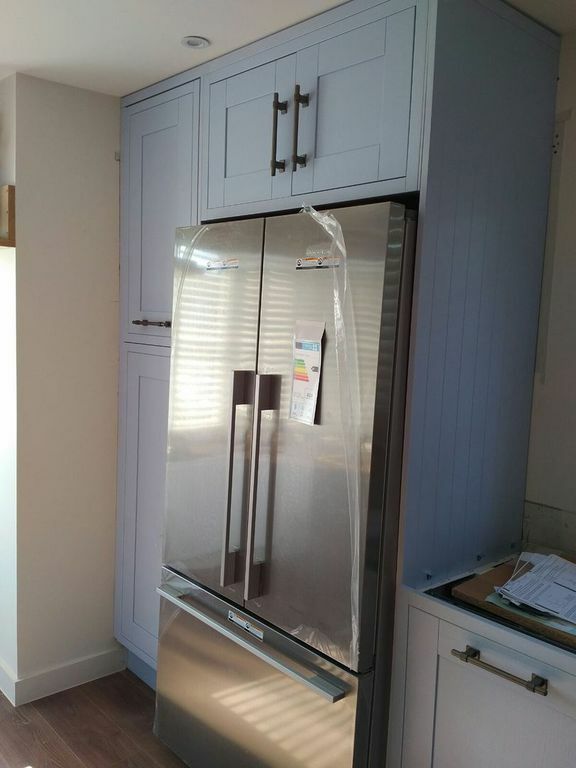 Our customers had a brand new "dream" kitchen from Sheraton that they wanted sprayed in a specific colour that they had always wanted a kitchen in. 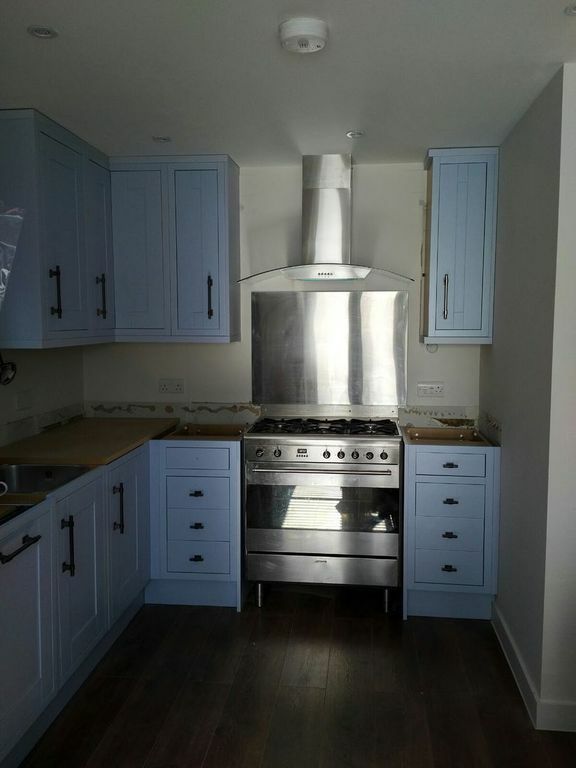 We had our paint colour-matched to Dulux "Blissful Blue", and the whole kitchen was delivered directly to our unit. 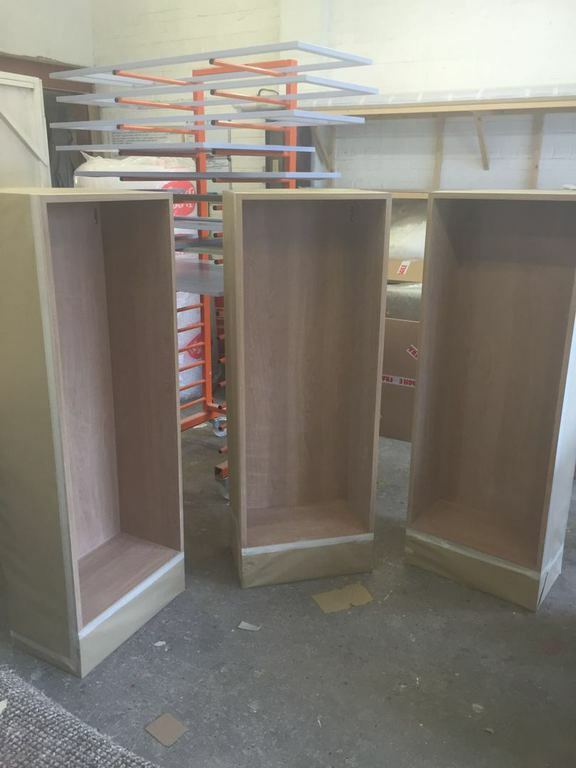 Each door, drawer, end panel etc was prepared, primed & sprayed along with the leading edges/framework of the carcasses. 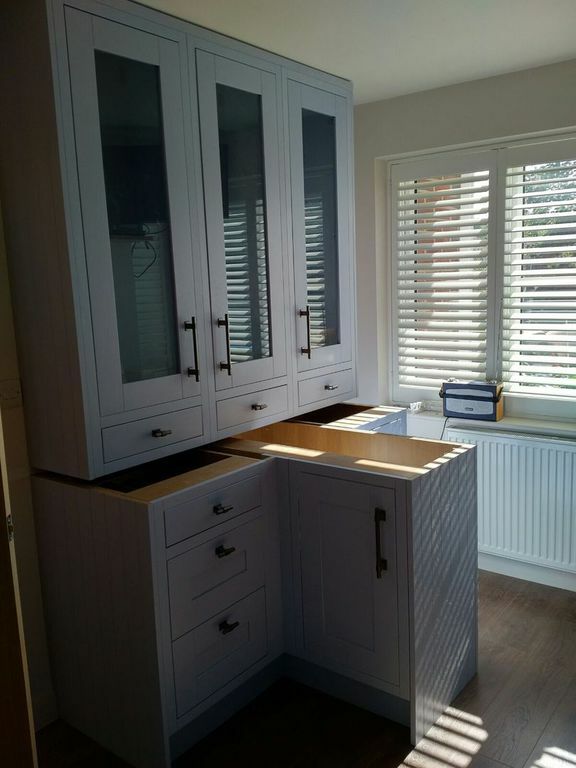 We then re-packaged the kitchen and delivered it to our customer's home to be fitted by their kitchen fitter. 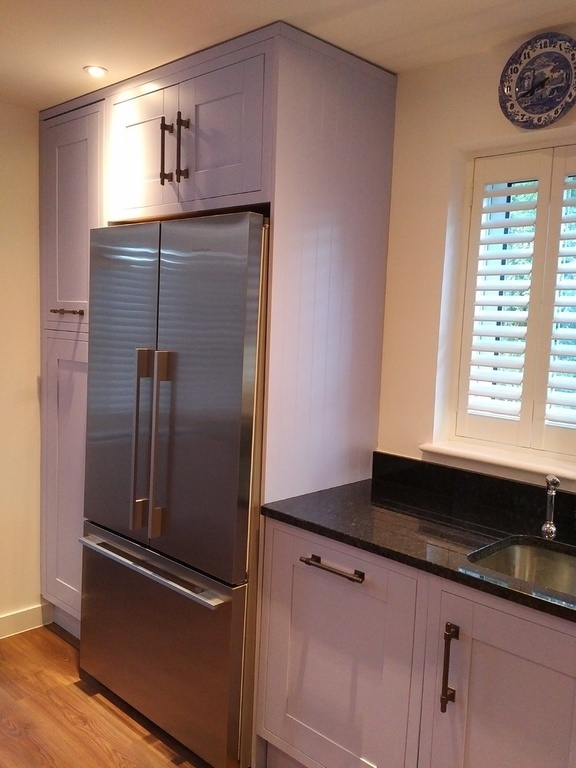 Our customers emailed us photos of the kitchen during the fit and once finished. 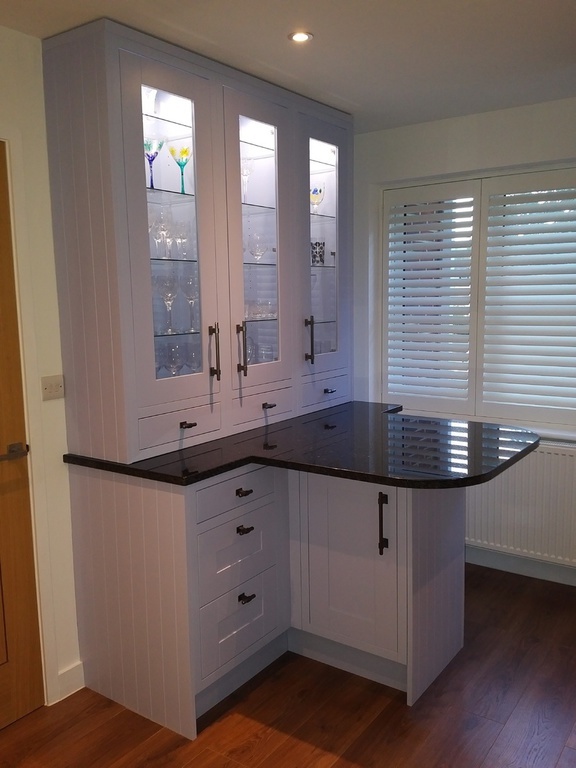 They are delighted with their kitchen and emailed "The kitchen is still looking great and I love the colour. You did a fantastic job and I am very grateful. Hope the photos are useful to you". 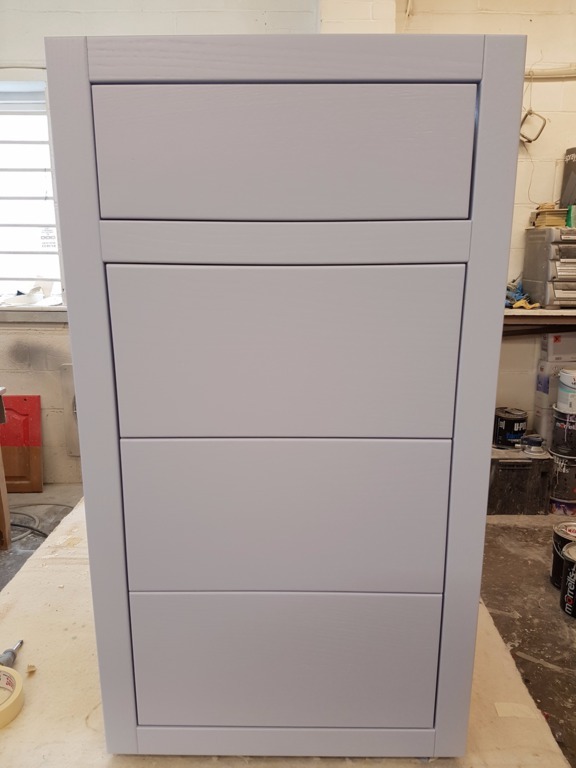 Our customers ordered their kitchen in white, and asked us to spray paint all of the base units into "Blue Diamond 1". 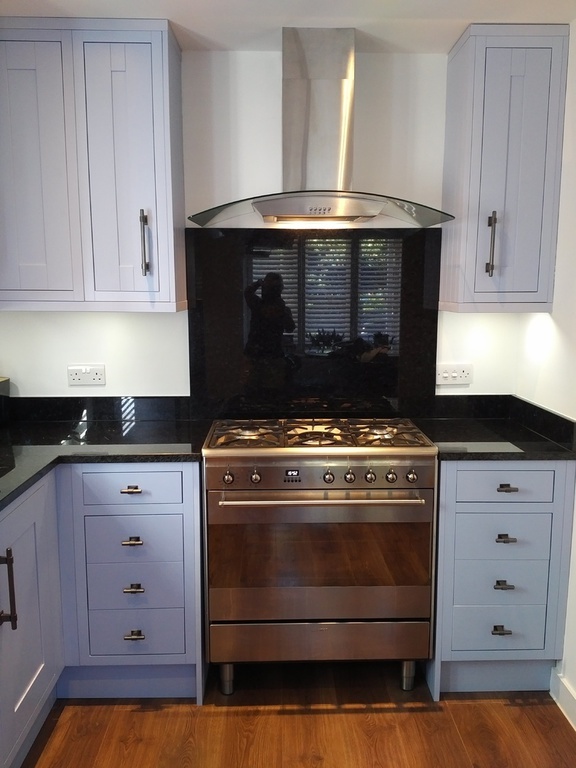 Our customers wanted their new centre island to be a feature in a different colour to their kitchen. They chose to have the paint colour matched to Farrow & Ball's "Downpipe". The kitchen in these photos was delivered to us and we spray painted it in paint colour matched to Dulux's "Cotton Breeze"
We have spray painted doors for quite a few local Howdens branches that are on display in their showrooms to give customer's examples of other options, and how you can add some colour to your new kitchen. 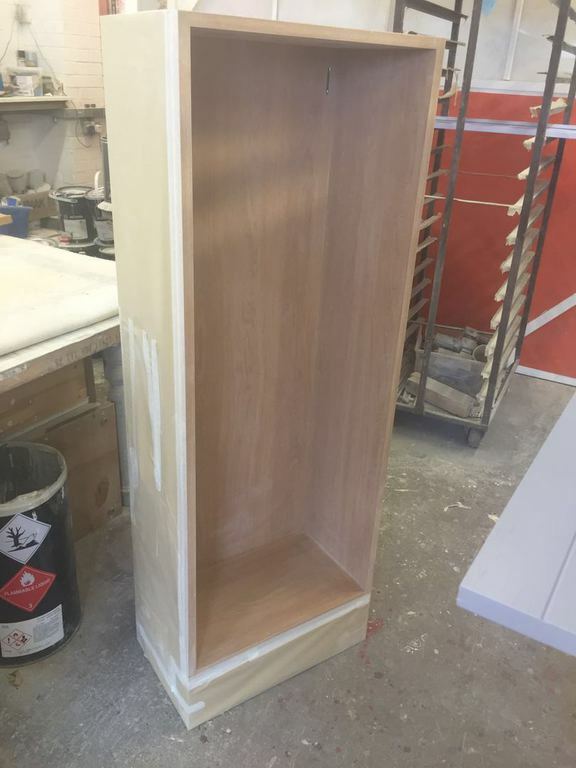 The photographs on this page have been kindly taken by our customers and emailed to us with permission to use on our website. With new kitchens our team are not present during the kitchen fitting and therefore cannot take photos.